407 Main Sail has been added to your favorites! 407 Main Sail has been removed from your favorites! HILTON HEAD ISLAND. Introducing Main Sail – a luxurious villa complex on Hilton Head Island overlooking Shelter Cove Marina in Palmetto Dunes resort. 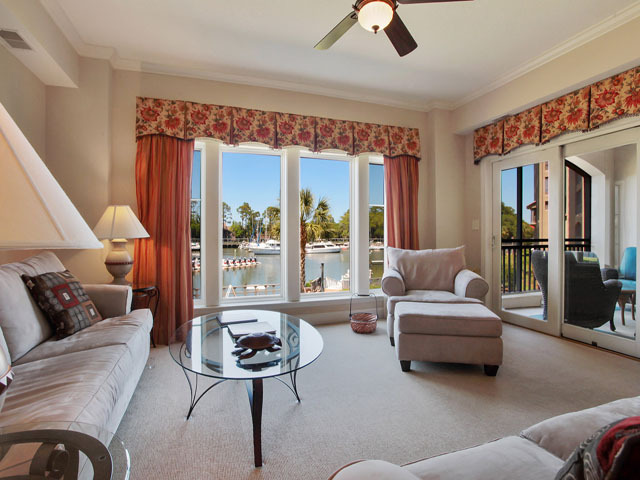 Each villa features water views from almost every room, screened porch, two master suites, and many upgrades. A private gated entrance leads to the centrally located Main Sail complex with beautifully landscaped grounds. Amenities include an expansive adult pool and spa, children’s wading pool, grilling area, and a playground. Enjoy strolling the extensive walkways around Shelter Cove Marina, which offers an array of wonderful restaurants and shops. Convenient bike paths lead to the beach in Palmetto Dunes. Main Sail also has a covered parking deck and elevators to all floors. 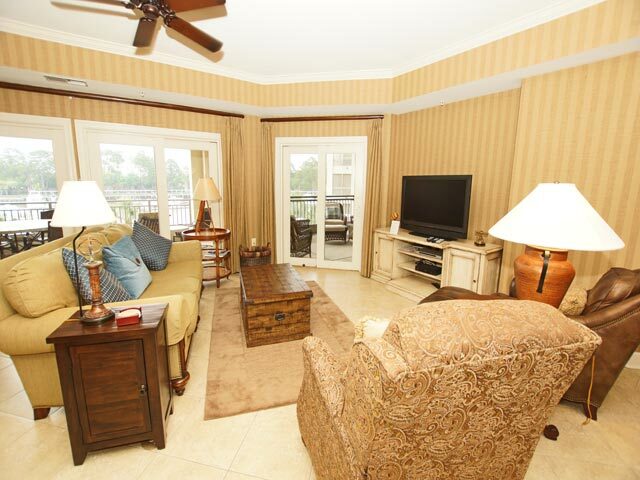 This beautiful Hilton Head villa offers great harbor and pool views. The entry features tile flooring and an eat-in bar for three. Off the kitchen is a dining area for six and a living area with 55” LCD flat screen TV/VCR/BluRay DVD, Boston Acoustics stereo, sliding glass door to a pool front balcony, and another slider to a screened porch overlooking the harbor. This great villa boasts two master suites. The first has a queen bed, 40” flat screen TV/DVD, door to the poolside balcony, walk-in closet, and a private bath with jetted tub and separate shower. The second master has a king, 40” flat screen TV/DVD, door to the harbor view screened porch, walk-in closet, and a private bath with jetted tub and separate shower. The third bedroom has two twins, a TV, walk-in closet, and a private bath with shower. A laundry room is located off of the entry with a full size washer and dryer. This fabulous villa is wonderfully equipped to meet all of your vacation needs. *Pet friendly with a small pet fee. 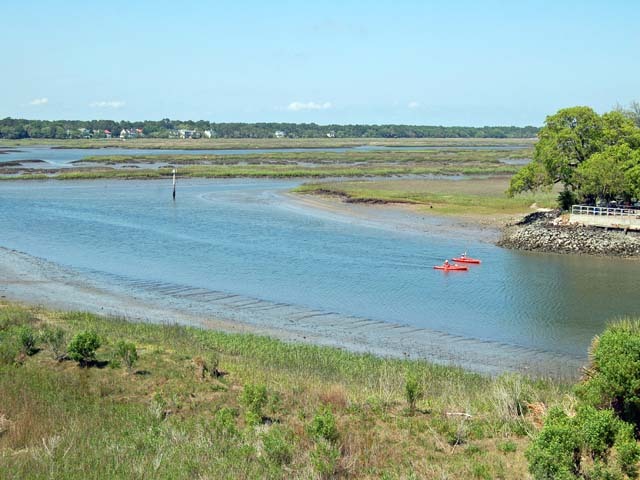 Call Island Getaway for details. *Free shuttle service through Palmetto Dunes Buggy available April through September. 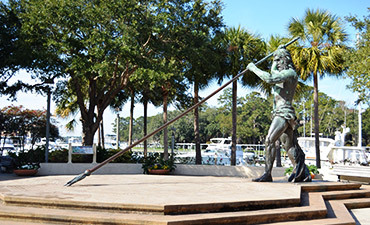 Shelter Cove is the home of a towering 12-foot bronze statue of Neptune, which doubles as a large-than-life sundial. When the trident’s shadow falls across the 26-foot wide base, the numbers indicate the precise time. Hailed as the world’s largest figurative sundial, the statue was originally cast at a foundry in Princeton, New Jersey and shipped by truck to Hilton Head Island in 1983.